This article tries to find out the socio-economic status of the workers in and around north east part of Kolkata. This study covered 150 subjects (male-140, female-10) from unorganized construction industries. Among the subjects 69% were Hindus and the rest were Muslims. Most of them belonged to general caste (59%) and schedule caste was the other major category. It was found that 61% of the workers were married. The average family size was of five members. Similar family size was reported by Self Employed Women's Association (SEWA). Railway porters also showed similar average family size. However, in mica processing industries the average family size was found to be seven. It was noted that most of the workers in unorganized construction units were migrant in nature. They usually used to come to urban areas from rural areas in search of livelihood leaving behind their families on seasonal basis. They used to go back to their native during harvesting season. The old traditional way of construction by digging soil, creating large base by brick layers before and further construction by thick wall reaching up to surface soil is practically not found now a days. Instead, presently in addition to mud digging/cutting there is creation of concrete base and erection of pillars on the base. For construction of building various types of jobs are there; some are more or less similar and some are different. Considering the job similarity, the workers had been grouped into six main groups [Figure 1]. 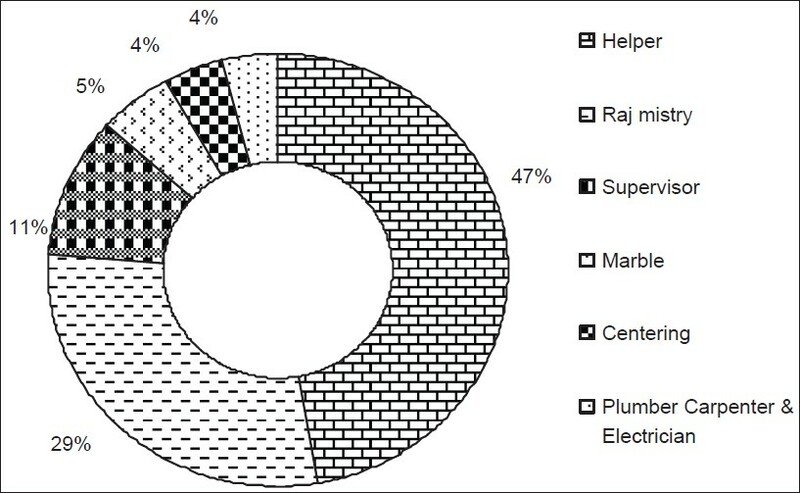 They were mainly helper-47%, rajmistry-29%, supervisor-11% etc. While construction of building the major construction work is done by the rajmistry and their helper. 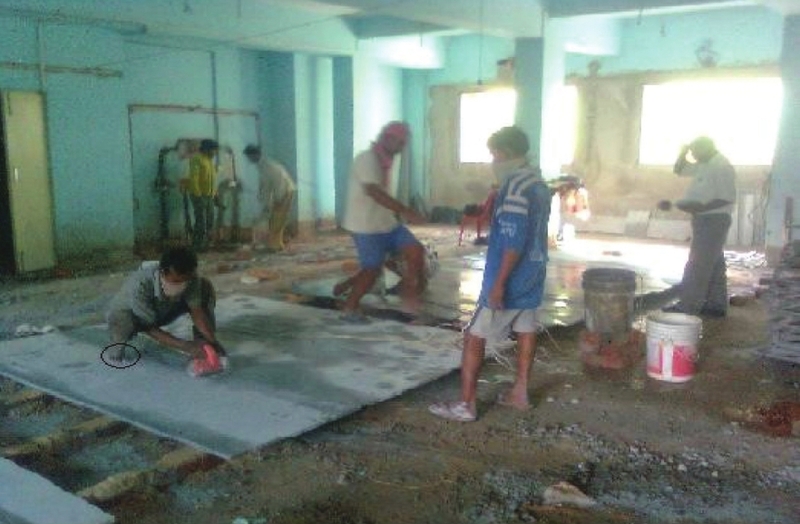 The system of helper and mistry is found in almost all categories of jobs (rajmistry, centring, marble, colour, plaster, plumber, carpenter, electrician etc.,). These helpers with practical training in course of their employment become mistry. [Table 2] showed the age group-wise distribution of subjects. While categorizing the subjects in age groups it was revealed that about 63% subjects were in the age groups of 20-39 years. The individual BMI indicated mainly the nutritional status and obesity of the subjects. The average BMI of workers was 18.9 ± 5.0 Kg/m 2 (range 13.7 to 29.9 Kg/m 2 ). The normal range of BMI is 18.5 to 24.9 kg/m 2 . , The mean value of the BMI of the subjects was within normal range. About 35% of subjects were suffering from chronic energy deficiency (CED) with BMI <18.5 Kg/m 2 . BMI >24.9 Kg/m 2 was noted in about 5% subjects and they were in obese category. According to WHO the classification of BMI, it is associated with degree of underweight and/over weight which at times is associated with risk of some non-communicable diseases. ,, Anaemia was found in 28% of the workers. Out of 35% subjects suffering from CED 48% were suffering from anaemia of different severity (mild-40%, moderate-8%). 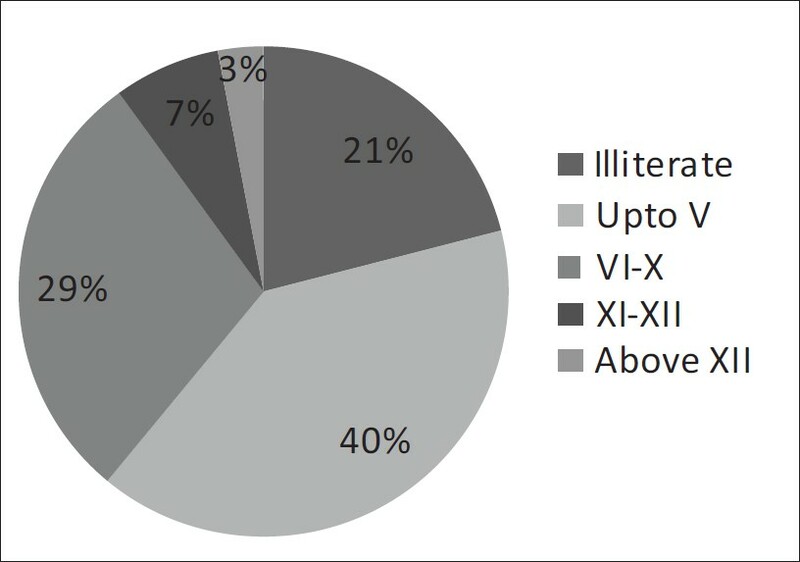 The literacy rate of the subjects was graphically presented in [Figure 2]. It is generally considered that the labourers of unorganized sectors are usually poor and illiterate. But this study revealed that about 79% of the subjects were literate. It was interesting to note that 10% of subjects have passed class X examination. According to Census 2011, in West Bengal literacy rate among general population is 77%  and the covered subjects followed almost the similar trend. It is also to be noted that 53% workers parents were illiterate. It was revealed that 40% of the workers were only bread and butter earner of their family. They had no other source of income. The average monthly total income of the subjects was Rs.4956/-(Rs.900/-to Rs.15000/-). At times it became very difficult for the workers to manage their family expenditure with their earnings. [Figure 3] showed the trend of income to that of expenditure of the subjects (as stated by them). It may be seen that in some cases expenditure was more than the income. This might be due to the fact that to cope up with their daily requirements they had to borrow/take loan from their relatives, friends etc., This hardship might result in stress and strain amongst the workers. About 53% of the workers were smokers and they smoke mainly bidi. Other important habits were chewing tobacco, panmasala, alcohol intake etc., Smoking may cause/aggravate lung ailments like cough, breathlessness, chronic bronchitis, heart disease etc. , Pulmonary function test impairment mainly obstructive type may be associated with smoking. Smoking for a long time might cause throat and lung cancers. , The workers misuse their money on smoking/alcohol consumption. About 37% consumed alcohol (foreign liquor-58%, country liquor-36%). They work hard for long hours. At times drinking of alcohol might help to reduce the psycho-social stresses or might resemble anxiety. Excess alcohol intake might result in loss of mental state, misbehaviour with the general public etc., and ultimately, this might result in scolding, assaulting and beating of wife and children etc., (30%). In good number of cases it was found that alcohol was being given by labour contractors in exchange of overtime (44%) as remuneration. They were mainly non-vegetarian (99%). The workers usually take main food three times a day- breakfast, lunch and dinner. They mostly consumed rice, sabji containing mainly potato, chapati, etc., The intake of animal protein (fish, chicken) was usually on weekly basis. They mainly lived in kacha house (73%). Most of them prepare their food in open place outside the house (surrounded by walls made by splitted bamboo mats and no ceiling/roof). About 23% subjects cooked their food in the living room. Their wife/female co-partners cook food while carrying their small child in arms. Usually they used wood (63%) as fuel for cooking purpose. Burning of wood emits gases like carbon monoxide (CO), carbon dioxide (CO 2 ) etc., Inhaling of these gases might cause cough, breathing problem, suffocation etc., Majority of them (70%) were using public tubewell (74%)/taps (21%) as a source drinking water. Plastic bottles (51%) and Aluminium buckets (28%) were the utensils for storage of water. Earthen pot was found in 16% of the cases for storing water. Separate latrine facility was present in 62% houses. Common latrine facility for a group was also there. For defaecation 54% of the workers used to go to open field. Most of the construction workers (61%) were using kerosene lamp, hurricane and other mode of light at night. The connection of electricity is yet to reach their homes. About 39% of the workers house had electricity facility. The electricity was used by them for light (37%), fan (32%), television (23%), radio (6%) and others [DVD player, freeze]. The main recreational activities were (a) participation in different types of sports and games (football, cricket etc. ), (b) observing or viewing TV or listening to Radio programmes. Majority of workers (71%) attended/participated different social functions/recreations like marriages in relatives/neighbours, rituals, festivals etc. About 58% of the subjects were aware of using contraceptive for spacing between the children. The different methods were oral contraceptive pills (30%), withdrawal methods (13%), ligation (10%), condoms (4%) etc. The subjects were exposed to different types of working environment. The distribution of workers according to present duration of exposure was given in [Table 3]. It is seen that present exposure of the construction workers on an average was nine years. The average total exposure for construction job was 14 years. Most of the workers in construction industry were migratory in nature. Most of the workers were working for less than five years duration (66%). The study revealed that only 22% workers were engaged in this job for generation together. This is contrary to the findings of SEWA who reported that 66% of construction workers in Delhi worked for generation together. About 83% of the workers were engaged on no work no pay basis. They worked from morning 6 a.m. to 6 p.m. with a lunch break for one hour or half an hour. At times they had to work for 10-12 hours. The maximum stipulated hours of work by Indian Factories Act 1948 was eight hours per day. , But for earning more and urgency of completing the work in fixed time, they had to work for long hours; of course they get minimum overtime allowances for this. These subjects were usually victim of different types of injuries. It was seen that the injuries were due to (a) cut by sharp objects (46%), (b) fall from height (20%), (c) falling of objects from height (15%) etc., The workers were not habituated in using preventive measures against any accidents, like use of helmet, gloves, boots etc., Injuries and accidents while at work were noted among 39% of the workers. Cleaning and washing of hands and legs properly after the work or during lunch break was not a common practice. Rough and keratotic skin of foot and palm was seen. Using of same un-cleaned clothes for days together at work was also observed [Figure 4], [Figure 5], [Figure 6]. The government has initiated different social security measures/programmes for the different working groups associated with industries in unorganized sectors. ,,, The welfare measures were given wide publicity/circulation through mass media. Yet, though these are also applicable for construction workers, most of them (95%), were not aware of the so called social security schemes like Old age pension scheme, maternity leave, housing loan, children education, accident benefits schemes etc., However, each and every subjects were appraised of the different schemes/measures individually during collection of data separately. The socio-economic status of the workers showed that they were poor. They are daily wage earners and maintain their family with small income with difficulty. It was noted that most of them were literate. They were addicted to alcohol, smoking bidi, cigarette. They did not consume adequate amount of nutritious food. In most of the cases it was found that they lived in kacha houses. A good proportion of workers cook their food in the same room in which they leave. They used wood for cooking their food. The source of drinking and cooking water was public tube wells or taps. Latrine facility was available in most cases. Their monthly income was less due to which they had to borrow from relatives or neighbours for fulfilment of their needs. They were not aware of the different social security schemes. Awareness programmes including individual/separate counselling was essential for overall upliftment. The authors gratefully acknowledge Director General, Indian Council of Medical Research, New Delhi; Director, National Institute of Occupational Health; Ahmedabad and Officer-in-Charge, Regional Occupational Health Centre, Kolkata for encouragement and providing facilities. 1. Tiwary G, Gangopadhyay PK. A review on the occupational health and social security of unorganized workers in the construction industry. Indian J Occup Environ Med 2011;15:18-24. 3. Construction Industry Development Council. First international seminar on skill upgradation of women workers in a globalizing construction industry. Ahmedabad, India, 2003. 4. NCEUS. Report on Social Security for Unorganised Workers. National Commission for Enterprises in the Unorganised Sector, Government of India, New Delhi. 2006. 5. Das S. Workers in unorganised sector lack security. Down to Earth. 2007. 6. Ramesh PB. Rethinking Social Protection for India's Working Poor in the Unorganised Sector. Cross National Policy Exchange: Asia Social Protection Papers. 2009. p. 1-18. 7. Rajasekhar D, Suchitra JY, Madheswaran S, Karanath GK. At times when limbs may fail: Social Security for Unorganised workers in Karnataka. Karmayoga 2009. p. 1-32. 8. NCEUS. Report on Conditions of work and Promotion of Livelihoods in the Unorganised Sector. 2007. p. 3. 9. NCEUS. The Challenge of Employment in India - An informal economy perspective. 2009. p. 1,3. 10. NCEUS. Summary and Recommendation; Skill formation and employment assurance in the unorganized sector. 2009. p. 72-84. 11. Sarkar P. Guide to Employee's State Insurance Act, 1948. 2009. p. 1-6. 12. Shukla TN. Workmen's Compensation Act 1923. 1991. p. 47-59. 13. Kulkarni GK. Construction industry: More needs to be done. Indian J Occup Environ Med 2007;11:1-2. 14. Lakhani R. Occupational Health of women construction workers in the unorganised sector. J Health Manag 2004;6:187-200. 15. Jinadu MK. Occupational health and safety in a newly industrialising country. J R Soc Promot Health 1987;1:8-10. 16. Roto P. Preventive Health services in construction. Encyclopaedia Occup Health 1998;93:10-1. 17. TIFAC. Industrial Safety and Hazard Management in Construction Industry. Technology Information, Forecasting and Assessment Council, Department of Science and Technology, Government of India. 2009. 18. Shah CK, Mehta H. Study of Injuries among Construction Workers in Ahmedabad City, Gujarat. Indian J Pract Doctors 2009;5:6. 19. Yuji N, Toshio H, Mari S, Naoki T. Asbestos-related diseases among construction workers in Japan. Asian-Pac Newslett 2004;11:10-4. 20. Decklin B. Construction accident claims. Available from: http://www.articleszone.com/article directory. [Last accessed on 2009]. 21. Gilbert N. Introduction to statistics. Statistics 1981;2:21-3. 22. Mukherjee D, Mukherjee D, Bharati P. Somatometry. Lab Manual Biol Anthropol 2009;1:190-1. 23. Mcardle WD, Katch FI, Katch VL. Body composition, weight control and disordered eating. Sports Exerc Nutr 1999;6:372-425. 24. Chakraborty P, Chakraborty G. Estimation of haemoglobin. Pract Pathol 1998;1:10-1. 25. EPI INFO; EPI INFO Software, version 3.4.3, of November 2007. Available from: http://www.who.int/chp/steps/resources/EpiInfo/en/epiinfo.exe [Last accessed on 2011 Dec 29]. 26. SEWA BHARAT. Socio-economic status of construction workers in Delhi- A study. Self Employed women's Association. 2010 1-16. Available from: http://www.sewabharat.org [Last cited on 2010 Jan 25]. 27. An occupational health survey of licensed railway potter with special reference to their work stress. Natl Inst Occup Health 1981;1:194-224. 28. Chatterjee SK, ganguli PK, Nigam NK, Rao NM, Kulkarni PK. Pneumoconiosis due to mica dust inhalation in the mica processing industries in India. Natl Inst Occup Health 1982;1:1-15. 29. Chakrabarti D. Indian Anrthropometric Dimension for Ergonomics design Practice. National Institute of Design. 1997. p. 34. 30. Chatterjee SK, Ganguli PK, Nigam SK, Mohan Rao N, Kulkarni PK. Pneumoconiosis due to Mica dust inhalation in the mica processing industries in India. National Institute of Occupational Health, Regional Centre, Kolkata, 1982. 31. Gangopadhyay PK, Saha T, Ghosh R. Occupational Health Problems of Stone Crusher in West Bengal - A Pilot Study at Birbhum District. Regional Occupational Health Centre (E). 2004. p. 2-9. 32. Gangopadhyay PK, Mukherjee AK, Chattopadhyay BP, Pradhan CK, Munda DS, Dalal B, et al. Evaluation of occupational health problems of cycle rickshaw pullers and redesign of cycle rickshaw on ergonomics principle. Min. health and family Welfare, GOI. Regional Occupational Health Centre (E), 2009. p. 21-30. 33. WHO Expert Consultation. Appropriate body mass index for asian populations and its implication policy and intervention strategies. Lancet 2004;363:157-63. 34. WHO. Physical status: The use and interpretation of anthropometry. Report of a WHO Expert Consultation. WHO Technical Report Series Number 854. Geneva: World Health Organization; 1995. 35. WHO. Obesity: Preventing and managing the global epidemic. Report on a WHO Consultation on Obesity, Geneva, 3-5 June, 1997. WHO/NUT/NCD/98.1. Technical Report Series Number 894. Geneva: World Health Organization; 2000. 36. Census of India. Provisional population table, Figures at Glance. West Bengal. 2011. 37. State- wise and employment wise minimum wages West Bengal. Ministry of labour. GOI, 2012. 38. SEWA Academy. 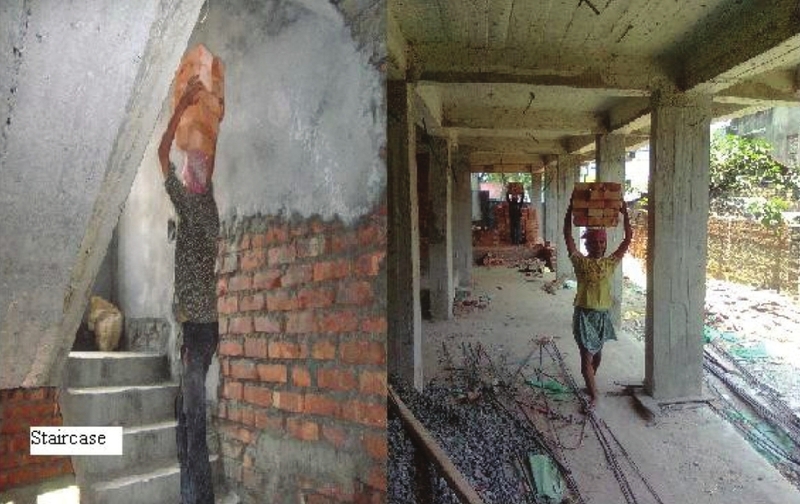 Labouring Brick by brick: A study on construction workers. Self Employed Women's Association (SEWA), Ahmedabad. India. 2000. 39. 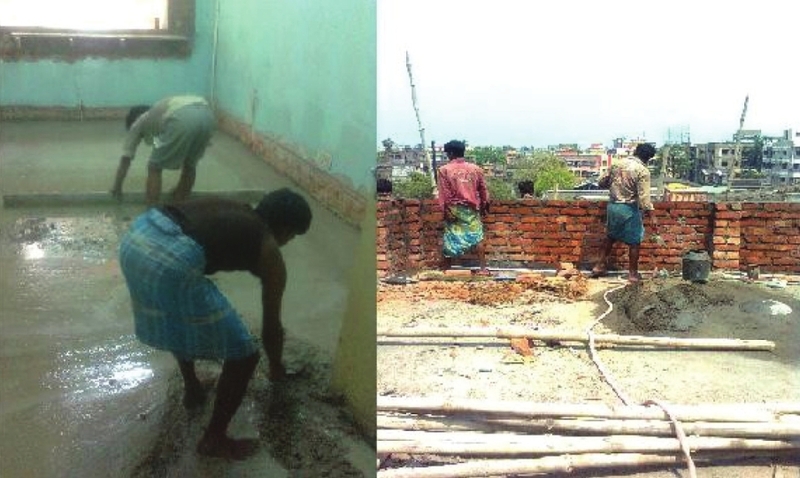 Bodhare T, Valsangkar S, Bele S. An epidemiological study of work related musculskeletal disorders among construction workers in Karimnagar, Andhra Pradesh. Indian J Community Med 2011;36:304-7. 40. SNS. Quit Smoking: See the difference. The Statesman. 2012. p. 14. [Last accessed on 2012 May 31]. 41. Singh A. Healthy nutrition may help mitigate smoking damage. The Statesman 2012 p. 5. [Last accessed on 2012 May 31]. 42. Mahajan N. Smoking is injurious to health. 2009. Available from: http://expertscolumn.com/content/smoking-injurious-health [Last accessed on 2012 Apr 30]. 43. Topdoctorsonline. Smoking is injurious to health 2012. Available from: http://www.topdoctorsonline.com/healtharticles/204/3/deaddiction/smoking-is-injurious-to-health. [Last accessed on 2012 Apr 30]. 44. Saiyed HN, Gangopadhyay PK, Chattopadhyay BP, Sharma YK. Study of Pneumoconiosis in underground coal miners. 1991;1-10. 45. Sarkar P. Working hours of adults. Factories Act, 1948 with Short Notes Vol. 6. Calcutta, India: Books-N-Books Publishers and Booksellers; 2008. p. A35.